There’s been a spectacular revival of dandy style in fashion magazines and on the runway, but it’s not until now that I’ve seen a strong new take with a darker tone. Photographer Peter Ashworth (previously mentioned here) recently collaborated with designer Stefán Orschel-Read (who also models in the shoot) to create Orschel-Read’s A/W fashion lookbook, “Mourning for Orlando” – a series that, at various turns, perfectly marries dandy and deathrock. 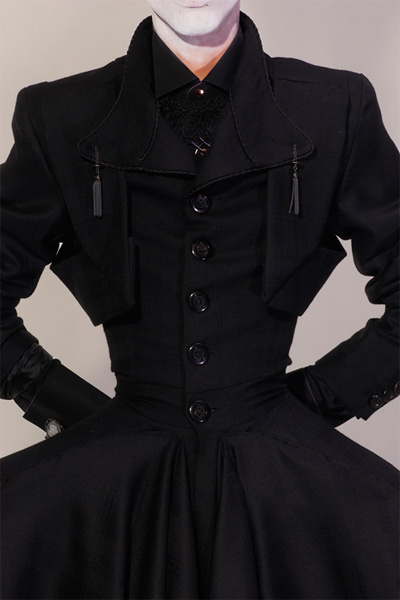 My favorite images are of the streamlined corset/jacket combo; I imagine Mr. Pearl would approve! The collection includes a wider array of unusual pairings, including geisha, punk, Baroque, and, amazingly, the 70’s leisure suit. How do they all combine? See for yourself. I need these items. For me. Stefan, welcome to the blog! The designs are amazing. I have updated the link – wish I’d found it before, there are a lot of awesome photos on there. I hadn’t realized that these were based on Orlando – “Mourning for Orlando,” what a great title! I have updated the post to include it. Oh, how can this BE?? I was only today reading a short history of the dandy and his influence on modern fashion! So great to see that others appreciate Beau Brummel. Ahh, the dandy. The last man I was in love with was a dandy. He wasn’t a corset sporting dandy but a dandy nonetheless with his high collared shirts starched to perfection and his gorgeous black frock coat that I would have gladly taken from him. But I digress. I wonder if I could adapt the dandy style into my wardrobe. 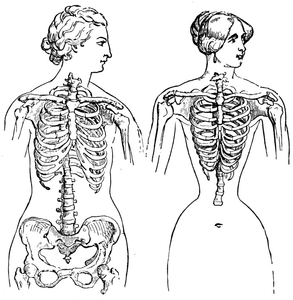 I don’t see many female dandies running about and yet I wish there were.